(Phys.org)—Located some 87,000 light years away, a dense globular cluster named Messier 54 (also known as NGC 6715) is a real gold mine for astronomers. Recently, an international team has discovered dozens of new variable stars in this cluster, improving the stellar census of Messier 54. The findings were presented in a paper published online on May 23 on the arXiv pre-print server. The team, led by Roberto Figuera Jaimes of the European Southern Observatory (ESO), made use of the Danish 1.54 meter Telescope at ESO’s La Silla observatory in Chile in order to obtain high-precision photometry of the very crowded central region of Messier 54. They have analyzed the light curves of 1,405 stars in this stellar system. Their observations were highly successful, resulting in the discovery 67 new variable stars. “A total of 1,405 stars in the field covered by the reference image were statistically studied for variable star detection. (…) We discovered 67 new variable stars, which consist of 30 RR Lyrae, 21 long-period irregular, three semi-regular, one W Virginis, one eclipsing binary, and 11 unclassified stars,” the researchers wrote in the paper. RR Lyrae variables are pulsating horizontal branch stars of spectral class A or F, with a mass of around 0.5 solar masses. They are used as standard candles to measure extragalactic distances. Among the group of 30 newly detected stars of this class, the team was able to discern that 17 of them are pulsating in the fundamental mode, eight are pulsating in the first overtone, one is a double-mode pulsator and four remain with an uncertain subtype. The periods of the newly found stars in the RR Lyrae group range from 0.28 to 0.76 days with amplitudes between 0.06 and 1.69 mag. However, according to Jaimes and his colleagues, the most intriguing addition to the stellar catalog of Messier 54 is the W Virginis variable. The scientists noted that this star’s variation does not follow the pattern found for the other variable stars studied and classified in their work. They found a very well phased light curve with a period of about 14.8 days and an amplitude of 0.71 mag. “This is the only bright variable star on the blue side of the color-magnitude diagram far away from the red giant branch,” the paper reads. The scientists revealed that the amplitudes of 21 long-period irregular variables range from 0.05 to 0.46 mag, however they found no clear periods for these stars. According to the research, the amplitudes of the three semi-regular stars range from 0.04 to 0.45 mag and their periods span between 20 and 150 days. The eclipsing binary’s period was found to be approximately 0.2 days, while the amplitude of the deeper eclipse is of the order of 0.8 mag and the amplitude of the secondary eclipse equals 0.5 mag. The researchers concluded that their findings, especially regarding detecting new RR Lyrae variables, confirm that Messier 54 is of intermediate Oosterhoff type. 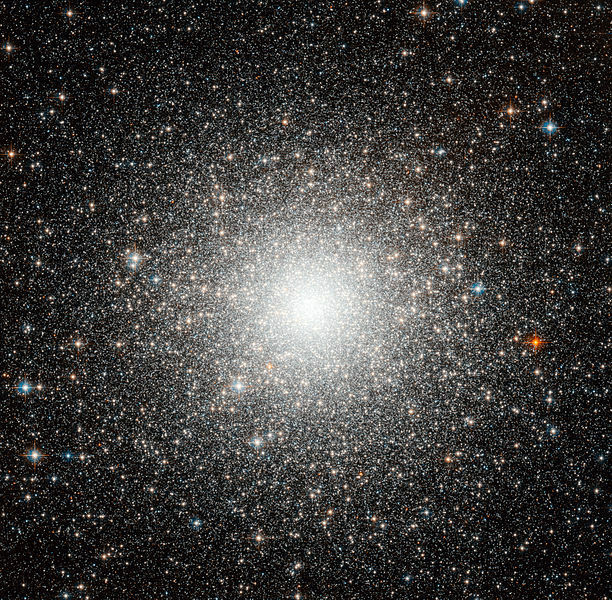 The so-called ‘Oosterhoff groups’ are two populations of globular clusters, nearly as old as the universe itself, that have weak lines of metallic elements, though they differ in their metal abundances.